The Humaniversity is an experiential school of personal growth and professional development. We offer workshops and programs that give you the opportunity to explore who you are and how you can lead a more fulfilling life. We teach this in a dynamic communal-living environment at our campus on the north coast of Holland, 45 minutes from Amsterdam. Veeresh was the founder and president of the Humaniversity. He was known for his innovative and inspiring way of working with people. He trained the therapists at the Humaniversity and lead workshops here and around the world. Already a successful therapist in London, he met Osho in 1974 and soon fell in love with his teachings. Osho gave him the name Veeresh, meaning "bliss beyond fear". Several years later he started the Humaniversity, creating a therapy center and community where friendship is the highest value. If you are coming here for the first time, you might want to begin by participating in a day or weekend workshop. For those who would like to learn as much as possible in a short period of time, we offer a 14-day residential journey of self-exploration called the Tourist Program. This powerful program at the Humaniversity will take you behind the scenes of your relationships, your job and your busy mind and give you the tools you need to create a new direction in your life. If you are able to continue your personal development for a longer time, you are welcome to extend your Tourist Program. You can also join our residential Student Program for one to twelve months. Our most comprehensive program is the One-Year Intensive. It combines all of the above programs into a year that will change your life forever. We offer several Trainings for self-development and professional skills. Many of these trainings allow you to follow a curriculum of workshops over the year and are designed to fit within your current living and work situation. We also offer individual sessions and specialized programs for addiction, health and wellness, teenagers and parents and kids. The AUM meditation is a guided process in fourteen stages, lasting two hours. Together with the other participants, it leads you through an exploratory and healing experience of fourteen major aspects of human nature: hatred, forgiveness, love, stamina, life energy, chaos, dance, sadness, laughter, sensuality, chanting, silence, respect and sharing. AUM stands for awareness, understanding and meditation. It is an excellent exercise to keep yourself alive, vibrant and open. The AUM is a Social Meditation – a great opportunity to meet old friends and create new friendships. Our therapy comes from a blend of many schools of Eastern and Western psychology. Much of our work is done in a group setting, so that you are supported by the people around you. Our therapy is based on two principles. First we help you to let go of everything that holds you back from what you want in life. Second we will support you to create the life that you’ve always dreamed of. In a safe environment you will take risks to step out of your self-imposed limits and practice new ways of being. We use sharing, bodywork, emotional expression and healing exercises in order to clear out your old, stored pain and frustration. We help you to replace it with love and the inspiration to move forward. We will guide you to open your heart in a healthy way to others. When you go home, you will be able to apply the practice you’ve had here to improve your relationships and the overall quality of your life. Osho was an Indian mystic, master and teacher. His philosophy and teachings have inspired much of the work of the Humaniversity. Osho promoted a life based on awareness, love and responsibility. He interested Westerners especially because he discussed topics from Eastern and Western philosophical and spiritual traditions in a lighthearted way, making them easily accessible. Many of Osho's followers took on a new name as a sign of their new commitment to learn about themselves. This is what is meant by becoming a "sannyasin" or disciple. Many of our therapists and staff have unusual names for this reason. You are not expected to be, or become, a follower of Osho in order to participate in our programs. Each person's spiritual beliefs are respected. Where are your programs and meditations held? You can also participate in the AUM and other Social Meditations all around the world. Which meditations can I do at your center? We lead the AUM Meditation and OSHO Dynamic Meditation each week at the Humaniversity as a regular part of our Tourist and Student Programs. If you would like to come during the week to experience one of these meditations, you are very welcome. Please contact us in advance to reserve your place. We also host the Mega AUM Meditation several times a year. It is an active social meditation which brings you from emotional expression to healing and celebration, in the company of many other beautiful people. What is the age range of the participants in your programs? We have participants from 18 to 80 years old. I have a physical problem or disability. Can I participate in your programs? We will help you to participate as much as possible. Please contact us for details. Do you offer massage or individual sessions? Yes. We offer individual sessions in which you can work one-to-one with a therapist on an issue in your life. You can choose from counseling, bioenenergetics, kinesiology, acupuncture, trauma healing and more. For body health, we offer various types of massage and OSHO Rebalancing bodywork sessions. Do the workshops include food and accommodation? Generally yes. Meals and dormitory accommodation are included in the fee of most of our courses. For festivals, the Mega AUM, and occasional programs marked non-residential they are not included. You are welcome to rent bedding and towels here if you do not wish to bring your own. Most weekend workshops start after dinner on Friday and finish after dinner on Sunday evening. If you would like to join us for dinner before the workshop, you can book this in advance. It is also possible to arrange to stay overnight afterwards. We have additional facilities including a coffee shop where you can purchase drinks or snacks. We use an in-house voucher system for payment, which we find to be safe and convenient. We provide dormitory accommodation. All of our dormitories offer semi-private bed spaces and have been recently renovated in an elegant modern style. We also have a limited number of private rooms available. If you would be interested in staying in a private room during your program, please contact us. We serve mostly vegetarian meals. If you have any other dietary needs, we ask you to provide these for yourself. If you have food allergies or other medical needs please let us know beforehand. When you make a reservation for a program, you will receive a confirmation with information about what to bring. Specific requirements will be included in the list of what to bring that will be sent to you after you make your reservation. Generally, you should wear comfortable casual clothing and bring a few sets of loose pants and t-shirts for dancing, exercises and meditations. If you are participating in a workshop over the weekend, you may wish to bring some stylish clothing to wear in our nightclub. Depending on the season it is also good to have warm clothing suitable for walking on the beautiful Egmond aan Zee dunes and beach. If you stay overnight at the OSHO Humaniversity, you are required to have an HIV negative test result. Since activities in the programs can include close physical contact, participants need to be free of any infectious diseases. The HIV test needs to be not older than one month if it is the first time you are tested, and not older than three months if you have been tested before. It should state that you are free of HIV antibodies 1+2. The test can also be done when you arrive at the OSHO Humaniversity for a fee of € 42.00. Do you have a telephone, internet access, and a laundry that I can use? We have free Wi-Fi access, and coin-operated telephone and laundry machines available at the OSHO Humaniversity. Yes. The main shopping street of the village, with supermarkets, drugstores, clothing stores, and cash machines, is a 10 minute walk. Can I live and work at the Humaniversity? We welcome new people in our community. The Community Experience Program allows you to live and work with us. Can you help me to get a visa to come to your center? After you have paid the full fee of your program, we will send you a letter confirming that your stay is paid for. You can take this letter with you to the embassy to get your visa. The Humaniversity is a private institution and does not meet the requirements for the issuing of student visas. Can I stop by and have a look at the Humaniversity? Yes, you are very welcome. We are open every day from 9:00 to 18:00. To have a tour of our campus, please come on one of our Open Days, which begin at 15:00 on the first Sunday of each month (excluding January and August). We will give you a general introduction to our work and answer questions about our programs. The day ends at 18:00. My English is not very good. Will this be a problem for me? Only a basic knowledge of English is necessary. Many of the sessions are focused on moving and feeling, not on speaking. If necessary, you are welcome to bring a translator with you. Please contact us for more information. What language is used in the programs? Because our participants come from many different countries, all of our programs are conducted in English, though over 20 languages are spoken on our campus. You need to arrive at least one hour before your program begins in order to complete registration. Once you make a reservation, we will send you the registration times in the confirmation. The times of all courses are included in the course descriptions in the calendar. How do I get to the Humaniversity? Take the train from Schiphol Airport or Amsterdam Central Station to Heiloo. See www.9292ov.nl or www.ns.nl for schedule. 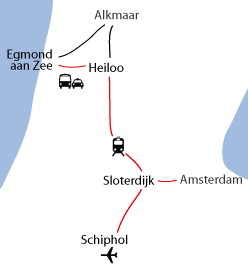 If you are coming from the airport, you will need to change trains at Sloterdijk, and the journey takes around one hour. When you buy your train ticket at Schiphol Airport ask the train information desk what time your train is expected to arrive in Heiloo. While still at the airport, call the taxi company, tel: +31 (0)72 533 1313 and reserve a taxi from Heiloo to the Humaniversity that fits with your expected arrival time. That way you won't have to wait too long at Heiloo. This taxi company charges approximetly € 12.50 per taxi from Heiloo to the Humaniversity. If you are more people traveling together, you pay less per person. They will bring you to the front gate of our property. You can also push the button for the OV-taxi at the Heiloo train station, but this lower cost taxi service usually takes longer to arrive. On return you need to call Taxi Zwart at least 1 hour before and wait at reception when they come. You can also call for a taxi directly to the airport. Calculate extra time, as they are not always punctual! If you are arriving by car, please send us details of your vehicle in advance. Please include the make of your car, the colour and license plate number. Please be aware that at times when we have many cars arriving, you will need to park at a nearby parking lot, which will cost you € 6.00 between 1st April and 30th September. Parking is free from 1st October to 31st March. For payments in advance we accept bank transfers and payments by Visa or MasterCard over the phone. On arrival, we accept cash, Visa, MasterCard, Maestro, and Dutch PIN cards. Please mention your name and the name of the program or product you are paying for. NOTE: Be aware that some time is needed before the payment enters our bank account. If it is for a program, please bring with you a copy of your transfer or statement of account; so that we can see that the money is on its way. Yes, we offer a discount for early payment (one month before the starting date of the program) for workshops, the Tourist Program, and the AUM Leader Training. This discount gives you 10% off the tuition portion of the fee. The tuition portion of the fee is the full fee minus food and accommodation. We also offer the same discount when you bring a friend with you who is new to the Humaniversity, and for students who are registered at an outside institution. These discounts can be combined, so if you bring a friend and pay early for a workshop, you can receive 20% off tuition. Day workshops and WOW discounts follow a different rule. For help computing any of these discounts, book the program online or contact us. Click on a workshop in our calendar to see the fee, or choose a program under the menu tab 'Calendar' at the top of this page. All of our prices include food and accommodation unless otherwise noted. 1) There are special shipping prices for meditation pillows, futons and yoga mats. For shipments outside of the European Union, there may be duties and taxes imposed on your order that aren't reflected in our prices. Check with your local customs office for those charges. In addition, some countries may charge an additional handling fee for delivery within that country. Albania, Andorra, Austria, Belarus, Belgium, Bosnia-Herzegovina, Bulgaria, Canary Islands, Channel Islands, Croatia, Cyprus, Czech Republic, Denmark, Estonia, Faroe Islands, Finland, France, Germany, Gibraltar, Greece, Greenland, Hungary, Ireland, Iceland, Italy, Latvia, Liechtenstein, Lithuania, Luxembourg, Macedonia, Malta, Moldova, Montenegro, Norway, Poland, Portugal, Romania, Russia, San Marino, Serbia, Slovakia, Slovenia, Spain, Sweden, Switzerland, Turkey, Ukraine, United Kingdom and Vatican City. How can I come to the Humaniversity on a low budget? In addition to taking advantage of our discounts, we offer festivals, events, and day workshops that range in price from €10.00 to €55.00. If you would like to get a full experience of our work, then come for our introductory group, A Taste. This group runs from 15:00 Saturday to 15:00 Sunday and includes meals and an overnight stay. The fee is €85.00. See here for the next available date. These are the Terms & Conditions for purchasing services, e.g. workshops and events etc. These are the Terms & Conditions for purchasing physical products, e.g. CDs, books, art, clothes etc. When you book a program or activity at Humaniversity, you will be asked to sign the Participation Contract and will get a copy. The Humaniversity welcomes feedback on how we can improve our communication and service to our participants to ensure that the service provided is valued and relevant at all times. Telling us when you are unhappy is important as it means we have an opportunity to put things right. If you have a concern about one of our policies, we won't necessarily be able to change things, but we will record why you are unhappy to help us improve for the future. We will do what we can to address your concerns quickly and with courtesy. In the event that your complaint requires a detailed evaluation it will be referred to a Complaints Committee. In any event, we aim to resolve all complaints within 30 days. For more information, please read our Complaints Procedure. Under the law, I am entitled to a 'cooling-off' period during which I can cancel this contract without giving any reason and receive a full refund without any deduction. This cooling off period begins on the date of contract and ends 14 days later, or when I start my program, whichever happens first. The date of contract is the date I sign my contract, submit my online application form, or pay for my program, whichever happens first. If you cancel your contract after the cooling-off period and before the start of your program: you will receive a refund less a €50 administration fee and any bank charges or other expenses directly relating to the transfer of your refund. If you have benefited from a special discount price for your program: your refund shall be reduced additionally by 20% of the amount you paid. If you cancel your contract after the start of your program: no refund will be made. Humaniversity reserves the right to alter or cancel the scheduled program of courses or their location at any time. It agrees to give you notice of any such changes at the earliest opportunity. If Humaniversity postpones or cancels a program and you notify Humaniversity that the altered schedule is not acceptable to you, Humaniversity agrees to refund all money you have paid for the program. All refunds will be paid within 14 calendar days of the date of cancellation. The general policy above applies to all programs. The following programs have additional special cancellation policies and payment terms. If you are unable to attend or need to reschedule your session, please give us 48 hours notice. If you miss your session, you will be charged for the full price of the session. If you begin Level I or Level II with participation in the WOW, 70% of the fee for the training year must be paid before commencing the training, and the remaining 30% must be paid before the start of the first weekend group. The PEC is designed to be a flexible course and has no replacement fees. In consultation with your course counselor, you may replace the workshops of the PEC with other workshops that we offer. The fee for each month is due at the beginning of the month. If you leave during the month, there is no refund. Payment of 30% of the course fee is due at the time of booking to confirm your reservation. In the case of cancellation before the beginning of the program and after the 14-day cooling off period, we will refund your payment less the 30% deposit. We offer a try-out period for all participants during the first three days of your program. If you decide to stop the program during this time, we will charge you the day price times the number of days attended. Each training year has two payment terms. The first term is due before the first day of the training year, and the second term is due 60 days thereafter. In the case of interruptions to the program, you will change to the quarterly module plan and payment structure. The program has 4 quarterly payments, each due at the beginning of every module. In the case of interruptions to the program, due to staff advice, financial or medical reasons the program will be extended by the number of days that you were out.